Unlike other mediums, such as paper or photographs, magnetic media cannot be stored indefinitely, even in perfect archival conditions. According to the Library of Congress, “optical discs and magnetic tape are made of materials that may have inherent chemical instabilities.” Over time, the data stored on magnetic tape degrades to the point of being effectively destroyed. 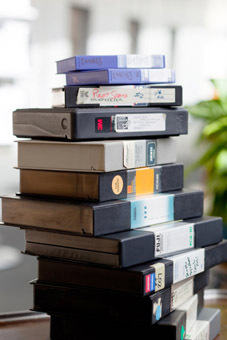 To compound this problem, very few organizations have retained the equipment necessary for viewing tapes that are more than 20 years old (including U-matic, Betacam, or 1-inch Type C formats). Finally, the technicians who know how to maintain obsolete equipment are also becoming few and far between. This magnetic media crisis is leaving institutions with thousands of important videotapes languishing in their collections, often inaccessible to the public, and at serious risk of being lost forever. MIPoPS offers services that help heritage institutions digitize videotape and provides tools and advice to help preserve and make video recordings available to researchers and the public. Icon indicates this is an open-source tool! AV Compass – Free online resource from the Bay Area Video Coalition. Help with identification, assessment, inventorying, and preservation planning of AV materials. PBCore – A cataloging standard for the description of audiovisual content. VRECORD – Open-source software for capturing a video signal and turning it into a digital file. VIDEOAIP – Creates Archival Information Packages that adhere to the bagit standard with an mp4 access file, technical metadata and checksums. MediaInfo – Displays the most relevant technical and tag data for video and audio files. MediaConch – An extensible, open source software project consisting of an implementation checker, policy checker, reporter, and fixer that targets preservation-level audiovisual files (specifically Matroska, Linear Pulse Code Modulation (LPCM) and FF Video Codec 1 (FFV1)) for use in memory institutions. Handbrake – A tool for converting video from nearly any format to a selection of modern, widely supported codecs. Ffimprovisor – An excellent guide to using ffmpeg. MKVToolNix – A set of tools to create, alter and inspect Matroska files under Linux, other Unices and Windows. Internet Archive – Anyone with a free account can upload media to the Internet Archive. They work with thousands of partners globally to save copies of their work into special collections.